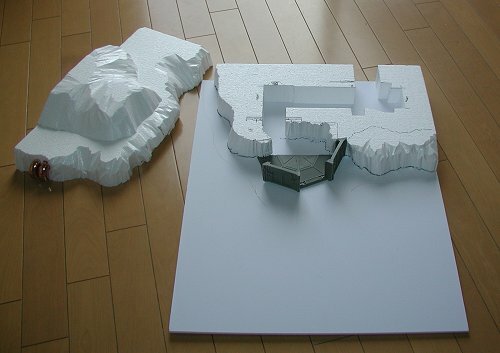 The resin model is half an octagon in shape, and I drew the cliff face to occupy one corner of a table. 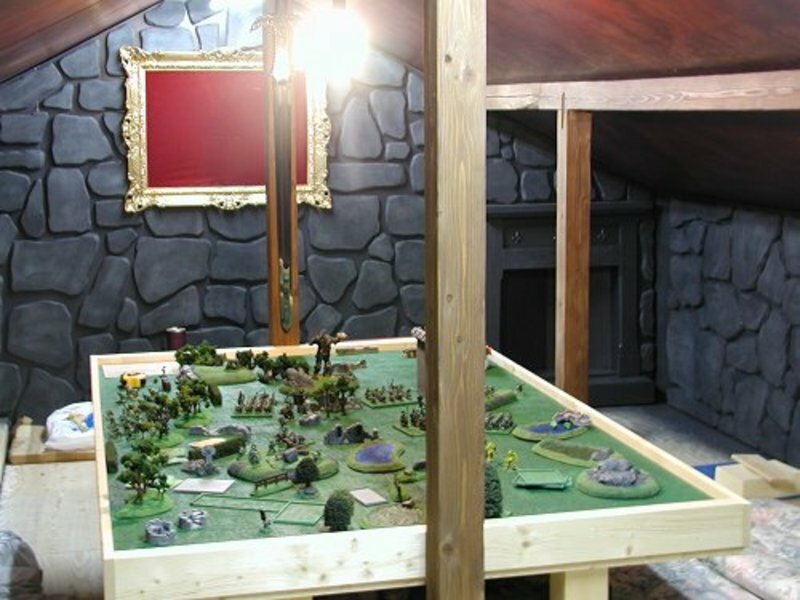 First, to use the room properly, we would need to extend the back wall 2-3". 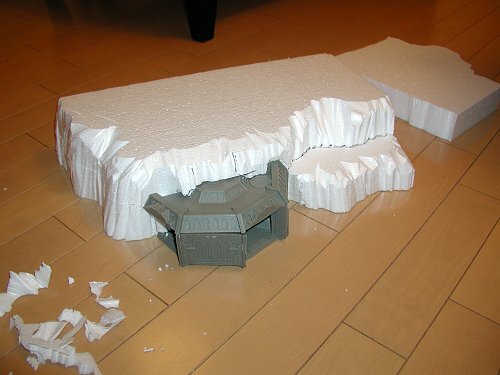 I ordered a couple specimen tank inserts from Forgeworld, to fill in the interior walls of the entrance room. Then I drew in a long corridor, with doors at either end, as I liked the claustrophobic feel of SpaceHulk interiors. Happily, I also had an unwanted computer lying in the shed, so I ripped it open and pulled out some useful bits - a small fan would look good at one end of the corridor, and several bits were suitable for flooring. 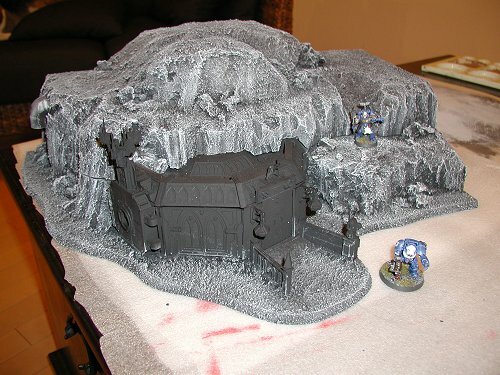 A couple of heavy bolter sponsons would look suitably intimidating at the far end of the corridor, for those foolish enough to enter without proper clearance codes. 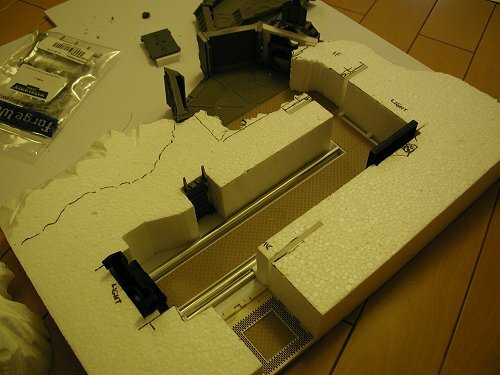 I also added a small stepladder area off the main corridor, to give a little more depth to the model. Cutting the polystrene was pretty tricky, as the cliff would be in two levels. The lower level would be permanently attached to the room walls, but the top would need to be lifted off in order to access the interior. Cutting in 3 dimensions on sloping walls was a hassle, but worked well, as the joins should be fairly well hidden. 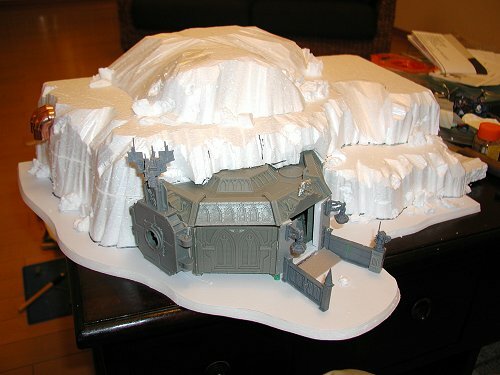 I added an extra small hilltop to the top of the model, to get rid of the flat appearance. 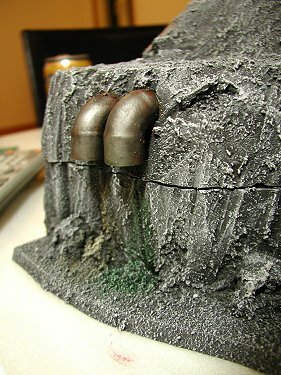 A couple of copper pipe elbows jammed into the side of the cliff would give potential access to all sorts of genestealer-esque gribblies. The rest of the interior was carefully cut with a hot wire cutter, and now you can clearly see the shape and layout of the corridor. 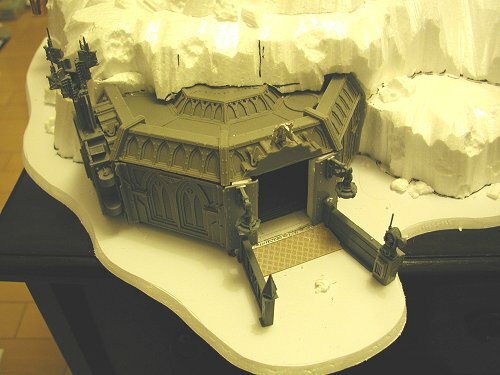 The whole model was mounted on fairly thick foamcard, as the entrance vestibule would be quite fragile. Some of the details are now visible, like the black fan at the end of the corridor, and the stepladder going up. I wanted to increase the feel of depth and hidden areas, so I raised the floor up about 10mm, and laid pipes alongside the main corridor floor. These would be covered with mesh eventually, once the pipes were painted. 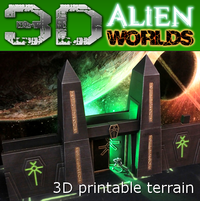 The main walkway was floored in a textured steel plasticard, from Tamiya. With the interior done for now, I turned my attention to the exterior of the model, by adding broken clumps of rock here and there. Delving deep into my bitz box, I found a large broken piece of Forgeworld gun chassis, which with a little trimming fitted nicely over the gap in one wall. It even had a small hole in the center, which I could model as a thick porthole window. 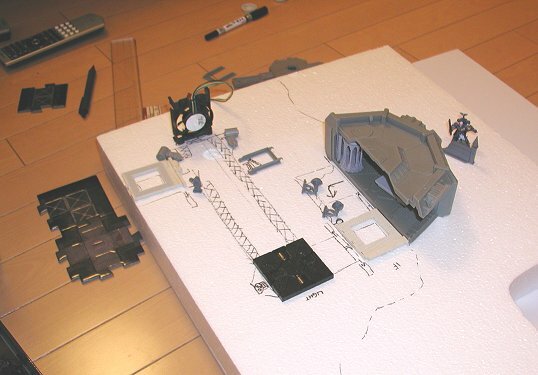 Some Battlefleet Gothic parts served as the communications antenna, and another as the metal eagle above the doorway. The exterior door, by the way, can be lifted out by sliding upwards once the roof has been removed. 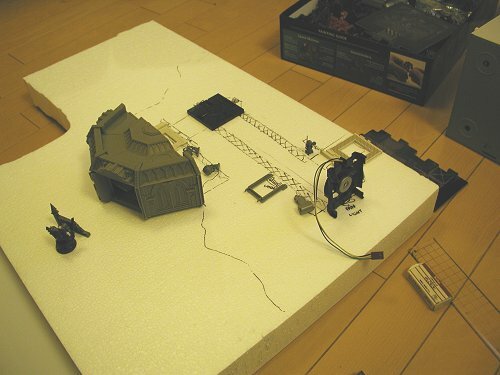 Other fittings were mostly taken from the 40K building models (walls, columns etc), mixed in with vehicle parts (missile launcher tubes, bulldozer blades). The messy bit - texturing! 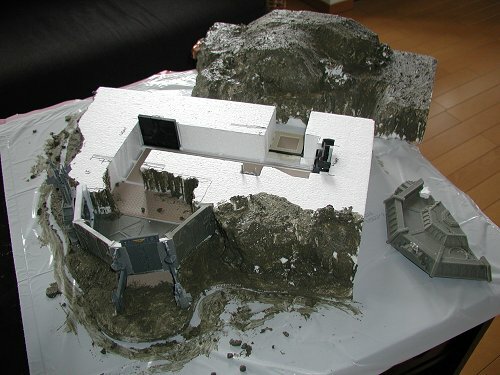 A thin layer of instant cement was dribbled and spread over the exterior of the model to provide quick rocks. 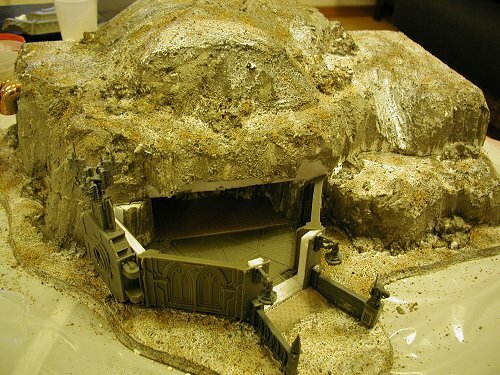 Knocking off excess dried cement, I went over the whole model with a PVAglue-water mix to strengthen it, and quickly scattered citadel sand over the wet glue mix. This breaks up the rocky surface more, and gives a finer finish for drybrushing. 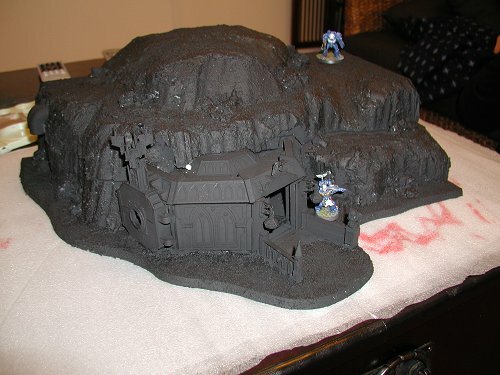 Almost a whole can of matt-black spray paint went into this model, covering every nook and cranny of the cliff face. Heavy drybrushing with a 2" brush and mid-grey got the painting done quickly, and then a final light-grey drybrush brought out the rocky texture. 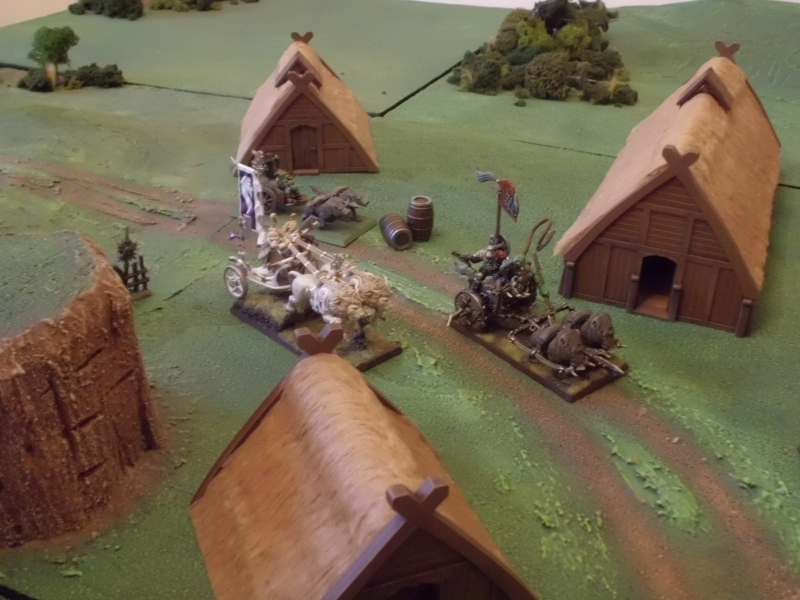 Happily, a good match for these Space Marine bases! Heavy, HEAVY drybrushing with boltgun metal over all non-rocky bits of the model gave a good grimy feel to the research station, accented with shining gold trim. 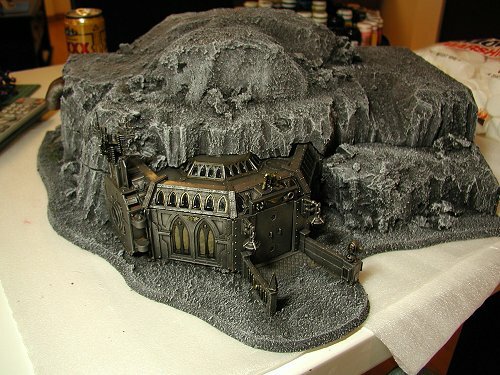 After all, it will be have a resident Adeptus Mechanicus Magos stationed there, so it needs to have a little embellishment, and non-secular appearance. 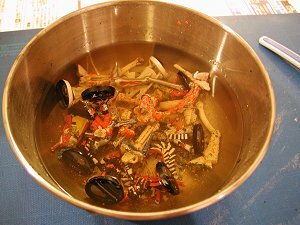 A huge amount of Badab Black wash went over the top of the metal areas, to darken it down. The pipes on the side were de-sanitised by adding really unpleasant stains using Sepia and Green washes.